Remember back in January when it was discovered that Beyoncé had lip-synched the National Anthem at the Presidential inauguration? In some ways, this fake performance perfectly embodied the decay of the Washington political institutions from the real thing into a mere shadow of its former self. I think that aptly applies to the current crises of our Federal government as well…the crises as some see it of the “rollout” of Obamacare, the looming “debt ceiling” and now, the “shutdown,” of about 18% of our Federal government to name only the three most talked about topics that has our government hamstrung at the intersection of Impasse Way and Stalemate Street. This latest crisis, the “shutdown” of the government, for example, is shown for the fraud that it is by the awkward fact that the vast majority of the government is not shut down at all…in fact, most of it can’t be shut down, which is the real problem facing our nation. “Mandatory spending”, programs such as Social Security, Medicare and so forth is authorized in perpetuity — or, at any rate, until total societal collapse. Add to that the interest payments on our staggering and ever-mounting debt and you have a scenario where two-thirds of the federal budget is beyond the control of the Congressional federal budget process, leaving the focus on what they actually do have legislative sway over. Put simply, this means that what does get shut down is what is left within their control and why we are now hearing stories about Veterans being denied (through force in some cases it would seem) access to war memorials in Washington (which is an absolute disgrace in my opinion) or that the Grand Canyon has been closed. How on earth do you close the Grand Canyon??? All this amid reports that it is costing more to keep these closed than it would to leave them open. Madness. 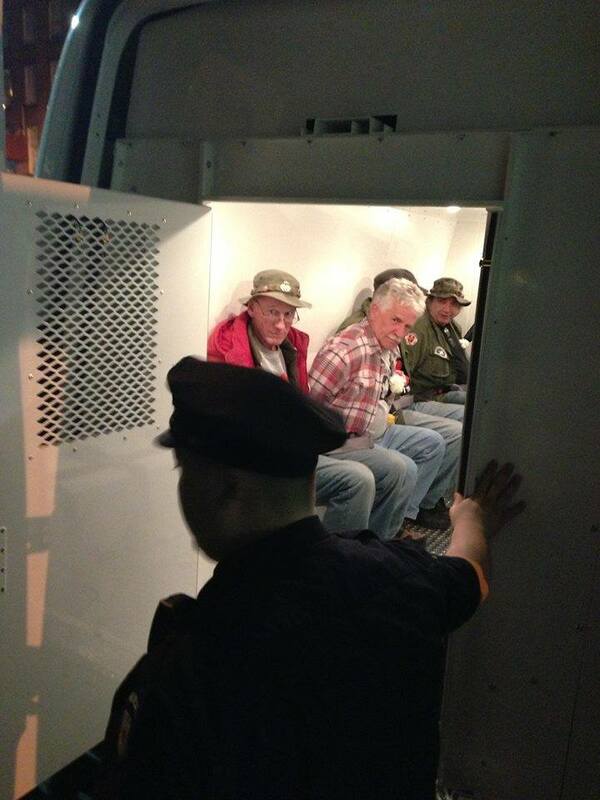 Vietnam Veterans arrested in New York City for ostensibly committing trespass because they wanted to honor their fallen comrades. World War II veterans breaking through the yellow police line tapes to get to the aforementioned WWII memorial, daring the park police to stop them. As one Veteran put it, “The beaches at Normandy weren’t open that day either but it didn’t stop us then”. Well put. It’s a heartening sign that the real American Spirit isn’t dead but I’m sure all of the Veterans, from World War II to the War on Terror have to wonder where the country they fought for has gone because this certainly doesn’t embody the ideals they sacrificed for. The Department of the Interior and the National Parks Service is not usually one of the more controversial government agencies but this has given them their chance to be the enforcement arm of a punitive bureaucracy. 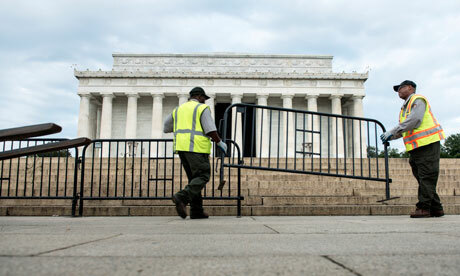 They dispatched the troops, fenced off Abraham Lincoln, blocked access to the Vietnam Wall and cordoned off Thomas Jefferson. I understand that Mount Rushmore in South Dakota is closed too but so far they have not been able to come up with a large enough drape to cover the monument so that those passing by can’t see it. You can still see the Statue of Liberty though….from the mainland only. I wonder, with the budget shutdown, where they came up with all that yellow tape when there seems to be a big fire sale on the red tape? Congress certainly could have loaned them lots of what they seem to be covered up with for free. Speaking of yellow tape, they issued a warning that anybody crossing the yellow line would be liable to arrest and there have already been isolated incidents of that. These days, few would be surprised to find them stringing yellow police tape along the borders of our own country, if for no other reason than to keep Americans in rather than anybody else out. If I were a member of the NPS police force, I don’t know how I could stand at a crowd barrier and tell a group of elderly soldiers who’ve flown in from across the country that they’re forbidden to walk across a piece of grass and pay their respects. Hopefully, some of them retained enough of their humanity not to try. I remember very well when General Ray Davis, a four-star Marine general who had won the Medal of Honor spoke to the local Rotary Club and told of his dream for a memorial to World War II veterans. He went out on the stump, speaking to local civic organizations and community groups about the need for a memorial. He and many others like him raised around $200 million in private donations to pay for this memorial. The Federal government kicked in $15 million or so, which probably paid for the grass and the sprinkler system but the message from them is clear. We give, we can take. For some in our Congress, the budget is all or nothing. The legislative branch is supposed to legislate. Instead, they are presented with an up or down vote on a single, all-or-nothing multi-trillion-dollar band-aid, cobbled together in closed door meetings to hold the lumbering federal juggernaut together while it puffs its way through to the next budget cycle. Ultimately, it turns democracy into a choice: tyranny or anarchy? It’s certainly a perversion of responsible government: Congress has less say over specific federal expenditures than the citizens of my hometown do over the budget for the Leisure Services department. We have no budget process and that is why our country is broken. What we do have is a budget process that can’t control the budget in a legislature that can’t legislate which has led to a government shutdown that has closed the Lincoln Memorial and the public bathrooms on the Blue Ridge Parkway (at the height of tourist season I might add). America’s net debt currently stands at 88% of our gross domestic product. Think about that for a moment…that means that 88% of the entire value of goods and services produced within our country last year, valued at 15.68 trillion dollars, is debt and rather than debate how we are going to dig ourselves out of this hole, we instead will soon be debating only whether to increase it and with what strings attached. The Grand Canyon isn’t a large enough hole to put all this debt in and we couldn’t do it right now anyway because it’s been closed due to the “shutdown” of our government. A hundred years of program expansion by the federal government has stretched the Constitutional order beyond all meaning. America was never intended to be an homogenized one-size-fits-all nation of 300 million people run by a government as centralized as ours. It’s little surprise that when it tries to be one it doesn’t work terribly well. Our political parties are a reflection of this great divide and many who speak out become a lightning rod for negative, sometimes hateful vitriol from those whose views are diametrically opposed to those of the espouser. Could you imagine what would have happened to Thomas Paine if Twitter had existed at the time? @Redcoat1776: When I see you upon the field of battle @ThomasPaine I shall give you death! @ThomasPaine: When men yield up the privilege of thinking, the last shadow of liberty quits the horizon. @TownCrier: You really should get a life @ThomasPaine. We have become a nation deeply divided over political issues, ideological issues, issues of race and issues of those who “have” and those who “have not”. I hate to keep bringing up the Grand Canyon but I see this as an excellent analogy for how large the political divide in this country has become. Unlike the geological formation, the political Grand Canyon of Washington is dark and ugly and very few know how to navigate its treacherous paths. Those that do already know what the rest of us are coming to learn….that we may already be beyond our own devices to fix it.